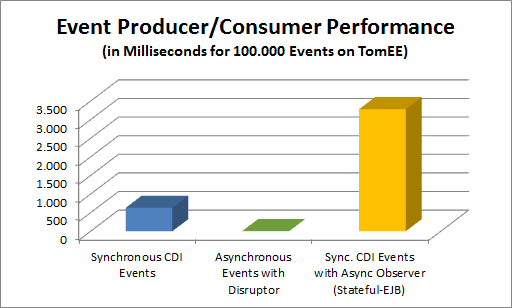 cdi offers synchronous events. they are more like a decoupled method call. that's fine for a lot of use-cases. in some cases the processing can take some time (in the observer method). a common trick is to use an ejb + @Asynchronous for the observer-method. with that the event-source can continue and the observer operates in a new thread. the add-on creates a disruptor-processor for every observer methods. the method gets invoked on the cdi-bean itself. the cdictrl-module provided by deltaspike is used for starting the cdi request- and session-scope before an observer method gets called (and to stop it afterwards). with that the application-, session- and request-scope (as well as all scopes based on them which start autom.) can be used for such beans. the result might look strange at the first view. however, the effects are quite clear. 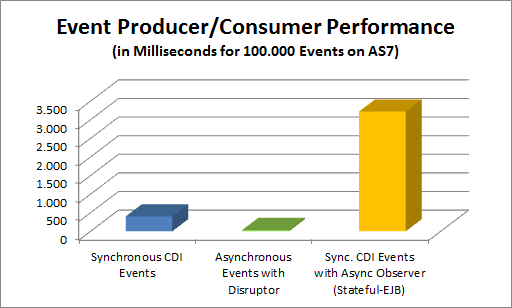 since the observer-logic in the demo is fast, the benefit of using @Asynchronous is lost. here the pure invocation of observers in ejbs is slower (than observers in a cdi-bean), because the container has to handle additional ejb features like transactions. the cdi bean as well as the stateful ejb is application-scoped and therefore only one (cached) instance is needed. in the charts above it's hard to see, but the numbers show that tomee is faster in case of the deltaspike/disruptor add-on (due to the highly optimized proxies of openwebbeans 1.2.x) and as7 is a bit faster with dispatching standard cdi events. currently the add-on works with tomee and as7 (tested with v7.2) and is available here. the repository also contains several tests, which illustrate the supported use-cases.